In east Africa there is a land that excites by picture or video alone. Iconic grasslands stretch for thousands of miles. Lions and giraffes roam plains that seem to reach the ends of the Earth. 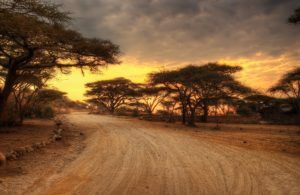 This land is the Serengeti, which means “endless plains” in the language of the tribe that calls it home, the Maasai. Thanks to Precision Air, today’s article is on this land that has changed little in the scheme of time. The Serengeti spans approximately 12,000 square miles near Africa’s east coast. Most of it lies in northern Tanzania, with a small point bleeding over the border into southwestern Kenya. It is a diverse landscape where the traveler can find grasslands, swamps, woodlands, and kopjes (rock outcroppings). Tanzania and Kenya maintain legal protection of more than 80% of the Serengeti, keeping this land as pure as possible – while still allowing the traveler to witness the miracle of life on the grasslands of Africa that stretch as far as the eye can see. A huge draw of the safaris in the Serengeti is the population of 3,000 lions that wander the park. 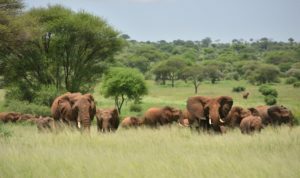 But, the Serengeti is home to approximately 70 species of large mammal, and 500 species of bird, which offers the traveler world-renowned views of a full spectrum of Africa wildlife. 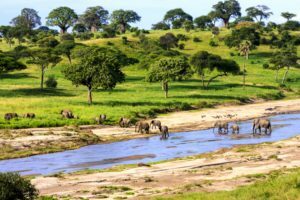 The Serengeti is also home to parades of elephants meandering about, giraffes feeding where no other animal can feed, hippos and crocodiles lazing in the watering holes, and vast herds of wildebeest moving in unison. Knowledgeable guides give the traveler a fantastic way to experience a safari in the lands of the Serengeti. Each year, the Great Migration occurs in August. This stampede of more than 1.4 million wildebeest travels from the Ngorongoro Conservation Area, southeast of the Serengeti, to the Masai Mara Reserve in Kenya. During this massive migration, gazelles and zebra join in the trip to better grazing lands. The migration back to the south begins in April and May, which completes the cycle. Considered a marvel of nature, the traveler will not be disappointed with such a magnificent display of nature. There is no other area in the world that can compare to the primordial feel of the Serengeti. That’s why Precision Air wants to fly the traveler straight to Serengeti National Park; with flights on Monday, Wednesday, Saturday, and Sunday of every week. They also offer up flights to the site of the second-tallest mountain in the world, Kilimanjaro; the capital Kenya, Nairobi; and other, amazing places on the African continent.